This Petra Leisure hammock is truly amazing and affordable; it’s seldom that this kind of hammock is available online. If you want great combination of sturdy stand and hammock bed, you may opt for the Petra Leisure made product of a wooden hammock stand plus a high-quality quilted hammock bed. This combination will take you anywhere you want to relax and swing to eternity, whether indoor or outdoor, this is the perfect hammock for the family. The hammock bed is made from thick cotton, double padded, which is a perpetual relief for the aching back and body. Swing like you are in cloud 9 and savor its softness and tenderness which is much better than rope hammock. This bed is 6.5 feet long and 4.75 feet wide, a lot of elbow room to make free-movements while you swing heavenly. This combo hammock can support 450 lbs. of weight which is basically the weight of two average built persons. Yes, that’s right; two persons could be accommodated by this hammock. A truly romantic time to bond between sweethearts. This assembly comes with wooden hammock stand, arc-shaped for durability and strength, teak finish, 14 feet long, water-proof, brilliantly stained and very flexible. This wood is made from a very tough European Larch Wood that could slightly bends without breaking. Very flexible, indeed! This hammock could be used in any type of weather. If it’s searing heat outside, the hammock is an ideal cooling and relaxing place. If winter comes, it is best to use it indoors but its fabric will never give you cold feelings as it stays warm even when expose to lower temperatures. If the hammock is left unintentionally under the rain, don’t worry, both the wood and the fabric (does not fade) are designed to withstand wet climate. But it is still better off to cover the hammock when it is not in used outside of your home, especially when there is no roof above it, to prolong its life. This Petra Leisure teak wooden arc with quilted fabric hammock assembly comes with elegant pillow which is also soft and lightweight; your sleep is more enhance and prolonged. • Complete basic accessories: The hammock assembly comes with complete basic accessories which include 2 steel chain (for adjusting tension) with “O” rings, 2 eye bolts, a pair of socket wrenches, 2 S-straps, pair of nuts and washers and 2 closed straps. These accessories are enough to assemble the hammock and start your day with total relaxation under the sun! • Could be hang on trees and other rigid poles: One thing good about this hammock is its independence from the stand, which can be disregarded if you are hiking, camping, mountaineering or any other activities that carrying a stand is not practical. • Heavier: At 100lbs. overall weight, this combo hammock is heavier than any other brands. But its weight is still conducive for outdoor and indoor use as the weight makes it more robust and the possibility of tumbling is very remote. 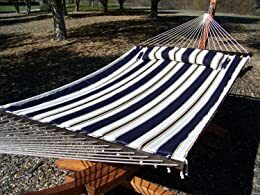 The Petra Leisure 14-foot Teak Wooden Arc Hammock Stand plus the Deluxe Quilted Elegant Blue Stripe, Double Padded Hammock Bed combination is highly popular among husband and wife and the entire family, especially during weekend breaks. It will certainly serve them better and longer than ordinary hammocks.